Having returned for a lovely few days in Cordoba which is a wonderful historic city with so much to see and do, plus a source of Indian food! We decided today, Saturday that we would do quite a long cycle to a town nearby recommended by the campsite host- to be fair she did not recommend to cycle just the fact it was a lovely place to see- it was I, Karen who got in her head we should cycle the 20k+ there on a very cold and grey day after much rain the previous day in an area known not only for its olive production but also for its pottery which of course comes from ……… clay. Off we set wrapped up, hands still freezing because why would we need gloves when coming to Spain, they’re only for cold old England. Turning left in our little small village with roads made of tarmac into the olive groves and onto a C road, slightly rougher, no tarmac just earth and stones- so quite bumpy for our lovely electric bikes and for Karen who even when actually not aiming for huge stones and cambers still manages to hit them. But on we went, freezing and bouncing along letting a few worries of the last day or so bounce out of our heads and then we turned onto the road backwards as we had taken a slight wrong turn. At this stage we should have then realised there was no correct turn off tarmac given the recent weather conditions and so the path became more ‘moist’ and dare we say a bit sticky and heavy going. But on we ploughed literally David taking the lead in a hope that the dry stony stuff would return and Karen shouting ‘should we go on any further’ and thinking I’m so over my I need to get out of the van mode. We carried on bikes slipping and sliding very slowly and feet pushing and shoving to assist the now struggling electric bikes. Finally, Karen gave up and started to push on foot which was also a bad idea as the clay became heavier both on the wheel and clogging the mud guards plus sticking to our trainers like a clay block, both bikes and humans now becoming covered in clay and with no easy way back or forward. 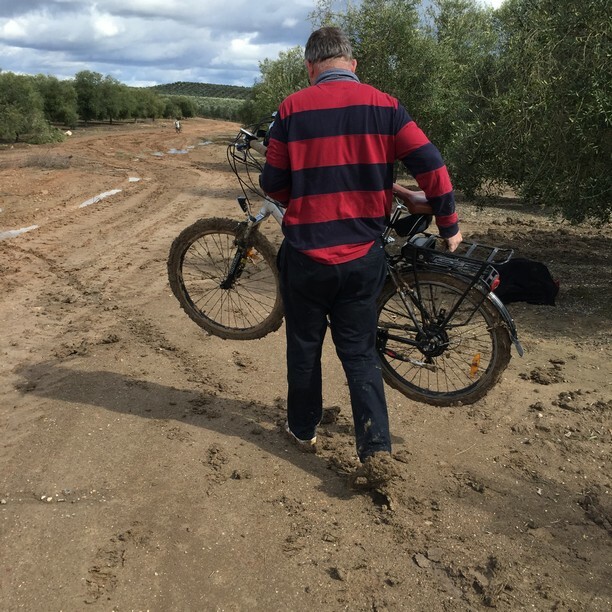 The olives were as ever very pretty and having just been fertilised the rain had been heaven sent from them and the farmers, but not for us as now we and the bikes were well and truly stuck. Unable now to either ride them and or to push them plus everything was now covered in a heavy clinging clay. The more we pushed the more the clay got stuck on the wheels and in the mud guards. 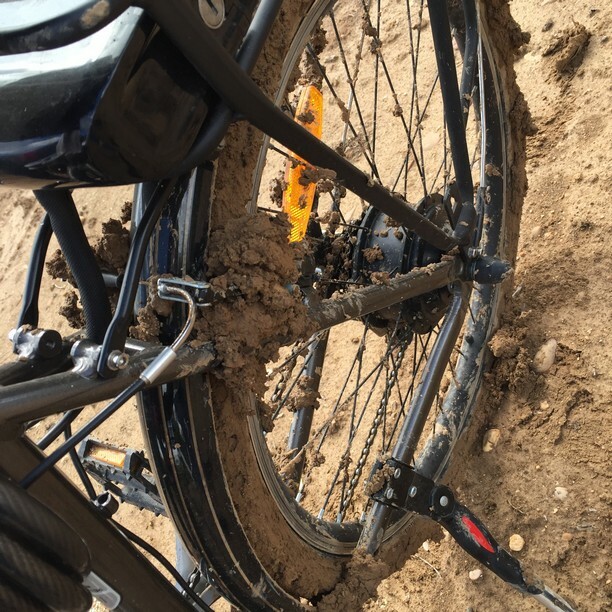 Was there a saving grace –perhaps that it wasn’t raining, but it was also now getting slightly warmer and with a very strong breeze and so the clay was now drying quickly like cement on the bikes and everywhere on electric parts that really should be protected. Plan A- off came the front wheel mud guards –that would free the clay from sticking but unfortunately we couldn’t get to the back wheel mechanism to take those off and so we continuing half pushing and half carrying the bikes, but having to stop every 50 meters or so to free the build-up of clay, stones, trees etc. We took the batteries off and carried them a way forward so as to make the bikes lighter, which it did but still the clay stuck on and laden the bikes down. 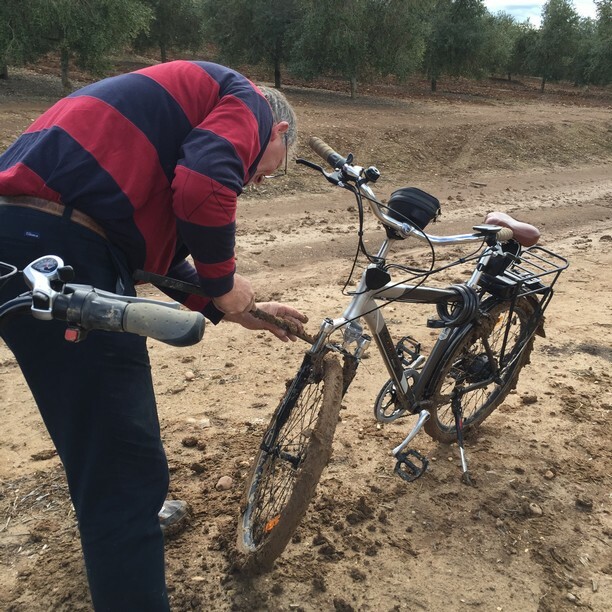 We pushed and heaved every which way we could and make progress of meters, each thinking –whose stupid idea was this, would we ever get out of this and would the electric bikes work again and was a back track to Seville going to be necessary. After a few hours and about 200 meters we made it back to the stone road and there after de- clogging again as much as we could we revved the bikes up and manoeuvred our way on the now dry and welcome stony path back to the garage and car wash. We sat the precious bikes in the spray car wash and as carefully as we could power hosed the clay off. Three power washes later they nearly looked as they should which was more than could be said for us as we were now clay dried -our clothes, hair, faces any and every part that could be covered in a heavy clogging clay. 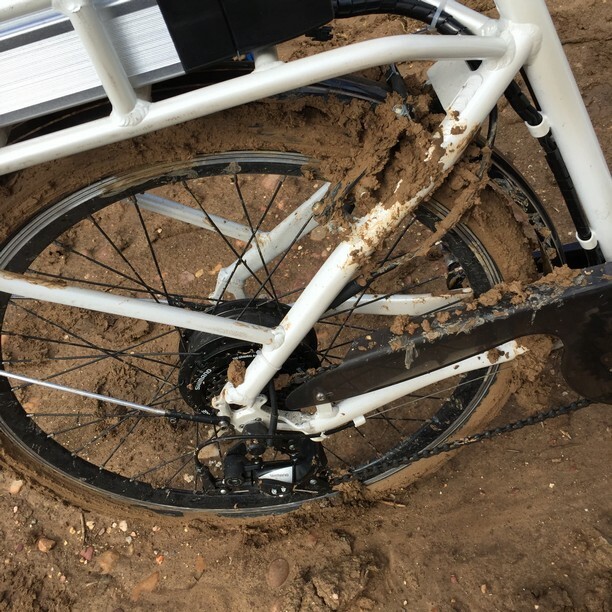 Moral of the story, when it’s cold and wet and you think you need some exercise perhaps just take a walk or indeed stay in your lovely cosy warm van and hope that the weather lifts, but do not take to electric bikes and clay as the form of exercise as the day out can change completely. Seville, a jewel of Spain and Jerez, producer of some of the world’s finest wines. I know you shouldn’t laugh at others misfortune but that did make me giggle. I could just see ourselves doing exactly the same thing. It poured it down here in Portugal all day yesterday, so much so that we moved location & didn’t bother venturing out again all day. Come rain or shine though today we were definately venturing out otherwise I’d have gone stir crazy. Will be heading to Spain in a couple of weeks so any other must do’s please let us know. Also any good stopovers. Well must do’s so far are Seville, Jerez, Cadiz, Tarifa / Bolonia, lastly and not least Cordoba. 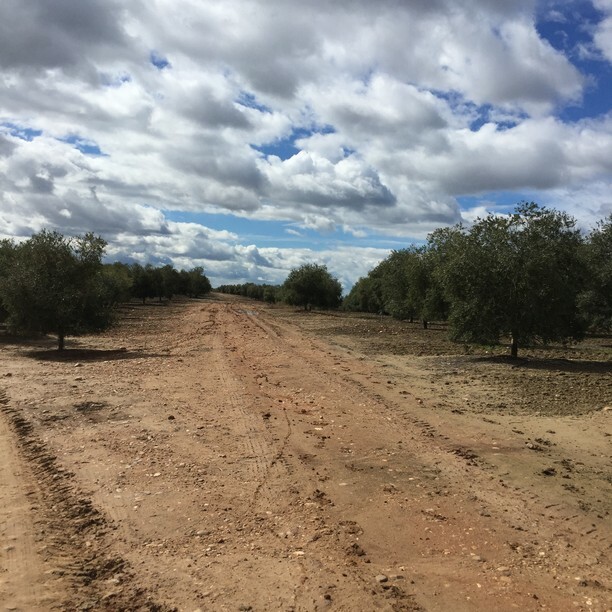 Aires Gelves nr Seville and Cabra (only two spaces idyllic). Ouch …. Sounds horrendous. You both must deserved a vino after. And I don’t envy who ever does the clothes washing … not by hand this load! We are lucky to be on a campsite with washing machines. but yes lots of washing to do. And it was warm and toasty! It idea is to make you laugh! it did not do that for us though a the time, and it took hours to get the mud off. Well you can stuff real cycling, it is too tough. Tarmac roads only ahead! Should have stayed in and watched the rugby…..oh sorry!!!! Very low, cycling in mud still seems like a better idea that watching rugby!